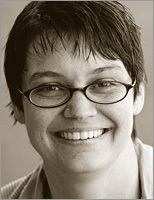 Addison Berry (add1sun) has been involved with Drupal since 2006. She is Lullabot's Director of Education and the Product Manager for Drupalize.Me, our Drupal video training site. She also travels around the world, speaking at events from local high schools to major conferences like OSCON, working to improve Drupal and Open Source software. Addi has been working with technical documentation and training since 2000, and was the Drupal Documentation Lead from 2008 to 2010. She is one of the co-authors for the O'Reilly book Using Drupal, published in 2008. In March 2009 she was awarded a Knight Foundation grant to improve Drupal documentation. In addition to her focus on coordinating documentation efforts she's provided core patches, maintains several contributed modules, and has been involved with the Drupal Dojo and the Google Highly Open Participation (GHOP) mentoring programs. In 2010 Addison was recognized as one of the Most Influential Women in Tech by Fast Company Magazine. "Those with a good familiarity with the Drupal CMS system interested in saving time during the planning process will love this book!...What really impressed me was the depth of coverage given within each chapter. " "This book lived up to my expectations. Using Drupal is easily the best book I have read so far for helping a person who knows nothing about the content management system (but who has a base familiarity with web hosting) figure out how the software works, how to add and configure features, and how to make powerful and useful web sites." "...a nice gift for the geeks in your family." "...a detailed and information-packed guide to the most promising contributed modules, and how they can be best employed for creating common types of Web sites."